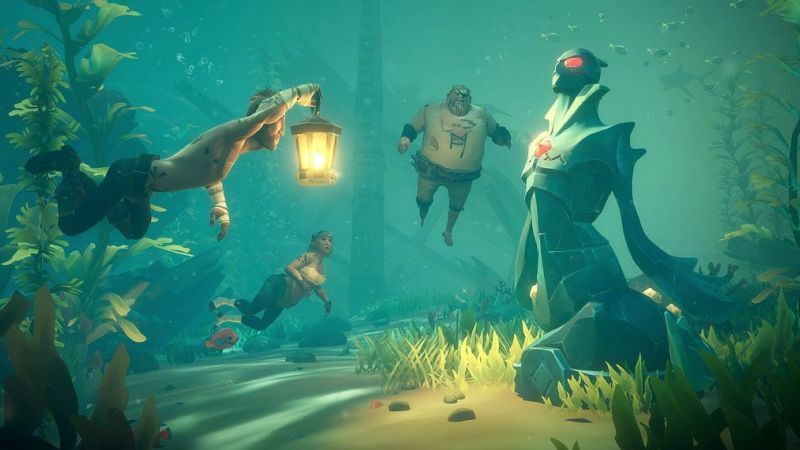 Rare has a new event ready for Sea of Thieves players in The Sunken Curse. The event went live on July 11th and sees players deep sea diving to find artifacts, treasure and more. The artifacts themselves are essentially cursed mermaid statues which must be destroyed. Some may also regenerate health and thus require a bit more violence than normal. The Sunken Curse will be available until July 25th. In that time, players can obtain The Wailing Barnacle Cosmetics which include a hat, dress and jacket from the Bilge Rat shop. Purchasable with Bilge Rat Doubloons only, you have until the duration of the event to earn them. Earning Bilge Rat Doubloons involves finishing standard Commendations (100 Doubloons) and Legendary Commendations (which grant an additional 50 Doubloons). All of the event’s Commendations are tracked on the Bilge Rat progress screen. Three unique titles have also been introduced and can be equipped from the Vanity Chest directly. A new Bilge Rat flag is also available for all players to raise on their ships. For more information on the event and update 1.1.6, check the complete patch notes below. The Wailing Barnacle Tattoo Set – Now available in the clothing shop on all Outposts, this tattoo set is purchasable with gold and here to stay. Legendary Skeleton Exploder Title – We heard feedback from our community that Legendary Commendations are deserving of a Legendary Title, so we have now introduced the ‘Legendary Skeleton Exploder’ Title. Existing players who have met the criteria can grab it in the Bilge Rat shop for free. If players unlock the Legendary Commendations required for Gunpowder Skeletons in the future, they will automatically be awarded this Title. Loading Screens – These now give players information about the latest goings-on and what’s new in the game. Front End Animations – Pirate animations have been updated when entering the game through the front end. UI Update – A small banner is shown on Commendations within the Bilge Rat progress screen when there are Bilge Rat Doubloons to be earned. Multiple server and client crash fixes. Further improvements and optimizations for all platforms are ongoing. Bilge Rat Doubloons which were earned but not rewarded correctly as part of the Skeleton Thrones Bilge Rats Adventure will be awarded. A fix will be rolled out over the next few days for players to receive Bilge Rat Doubloons which were not awarded correctly for the Skeleton Thrones event. Upon impact, cannonball knockback no longer causes unintended damage to fellow crew members. Bear & Bird Figurehead Loading Screen is now localised in all available languages. Mysterious Stranger conversation text is now correctly localised in German, French, Italian and Spanish. Ghost Trousers no longer appear broken on certain body types. Bilge Rat Trousers no longer appear inconsistent when equipped with a peg leg and mid-length boots. The Bilge Rat progression UI now correctly counts Gunpowder Skeletons event Titles towards the overall Title count. The option to enable and disable the Player Talking Indicator has been added back into Settings. Players should now see all their items once they have joined a new server. Loading Screen tips should no longer be clipping on 4:3 display screens. The ‘Gunpowder Plot’ Commendation and its Legendary Commendation counterpart may not unlock. A fix for this issue is being investigated. The time-limited Gunpowder Skeletons event cosmetics will be available again in the future for any players wishing to complete the set. The Hungering Deep rewards were not received by a number of players who earned them. A resolution for this is being investigated and more information will be shared when available. Athena’s Fortune Bounty Quests are incorrectly blank. Team is currently investigating a fix for this issue as high priority. Support team to reset pirates to the original selection. Some players may continue to hear muffled sound after being fired from a cannon. Players have reported that being fired out of a cannon again clears the muffled sound. The UI and pirates in the ‘Select Your Pirate’ carousel may not be visible for some players. Reports from players state the UI and pirates become visible after a few minutes.